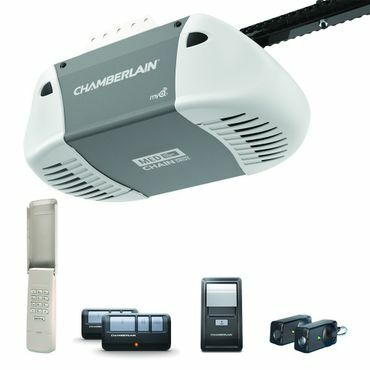 The belt-driven Chamberlain B970 garage door opener is powerful and well-featured. With a 1.25 HPS motor, it's got all of the strength needed for just about any residential garage door, and the motor and belt are covered by a lifetime warranty. The feature line-up includes built-in Internet connectivity for those who want to be able to monitor and operate their opener from afar, and a battery back up in the case of a power outage. The Genie SilentMax 750 belt drive garage door opener isn't as feature-packed as the Chamberlain B970, but its value is hard to overlook. The 75-HPc motor isn't as strong as the B970s, but is still plenty strong for any residential use, and the opener is widely judged to be pleasingly quiet. Smart features are built in, too, but using those requires the addition of the optional Genie Aladdin Connect module (Est. $95). The biggest downside is that there's no battery back-up. The chain-driven Chamberlain C410's .5-horsepower motor has enough power to handle most residential garage doors. Owners say it lifts even heavy doors easily. While chain-driven openers generally are louder than belt-driven models, most say that, like its predecessor model, it's actually pretty good in that regard, and we saw fewer complaints about installation challenges, too. The opener is also well-equipped in the feature department, though you'll need to spend a bit extra if you want to use its smart functions. 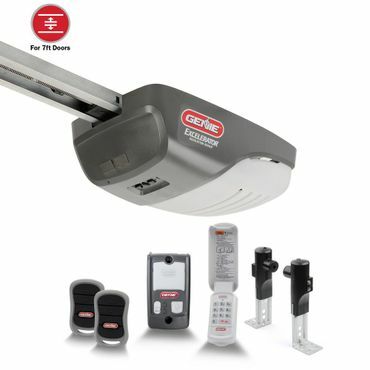 The German-made, .75-horsepower (equivalent) Direct Drive 1042V004 garage door opener doesn't use a belt drive or a chain drive. Instead, the mobile motor crawls along a stationary chain, making it exceptionally quiet. This garage door opener is also feature-packed, though the wireless entry keypad is an extra-cost accessory. Reliability is excellent, and installation is at least a little easier than some other garage door openers. This opener is also sold under the Sommer brand and with different model numbers, but all are similar. Screw-drive garage door openers aren't as popular as some other types, but feedback indicates that those that give the Genie Excelerator a try are largely very happy that they did. It's a fast performer, owners say, and the company claims that it can move a door at a rate of up to a foot per second. It's relatively quiet, too -- perhaps not the absolute quietest that you can buy, but certainly quieter than a chain-drive opener, and quieter than older screw-drive openers, users report. Belt-drive openers use a metal-reinforced rubber belt to raise and lower the garage door. Their quiet operation and strong reliability help make them the most popular type of opener, but they are also more expensive than chain-drive openers and can be a challenge to install for DIY-ers. If a belt-drive opener is a little too expensive for your budget, a chain-drive model can be a good alternative. These openers use a chain looped around a rail to raise or lower the door. The downside is that they tend to be noisy -- a particular concern for garages that are attached to the house. Instead of a stationary motor moving a chain or belt to lift the door, a direct-drive opener's motor glides along a stationary, spring-tensioned chain. Owners praise their quiet operation and terrific reliability. However, these openers are more costly than some belt-drive and chain-drive openers, including those that get equally good feedback. 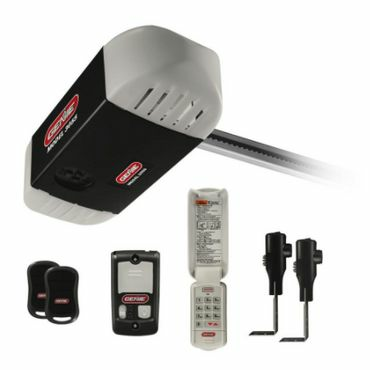 Do you need a garage door opener? Modern garage door openers include basic to advanced features that improve safety and deter break-ins. Examples include an automatic stop if a descending door encounters a solid object such as the hood of a car and light beam sensors that detect the presence of an object -- or a person or pet -- and stop a garage door's downward movement before accident or injury can occur. Available security options include remote lockouts for when you will be away from home for an extended amount of time, remote codes that change after each use, and lights that turn on automatically when your garage door opens or if movement is detected inside. Finding the best rated garage door openers is a bit of a challenge. Quality professional reviews are currently hard to come by, and we did not spot any that addressed current models. About the only credible, current, testing-based feedback we spotted was from Wirecutter, and it addressed smart garage door controllers rather than openers. That said, if you would like to add smart features to an existing garage door opener that you are otherwise perfectly happy with, the review is worth a read. Fortunately, owners aren't bashful about weighing in on their garage door openers. Though some models get only a handful of reviews others receive hundreds of unique ratings on sites such as Amazon, Home Depot and Lowe's. 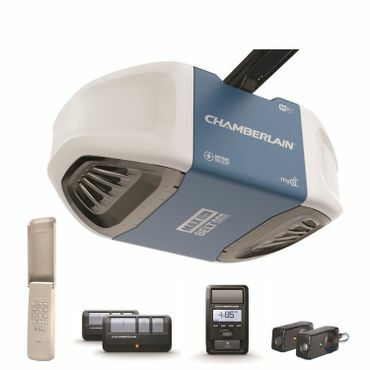 If you are interested in a Craftsman garage door opener, Sears is the place to visit. 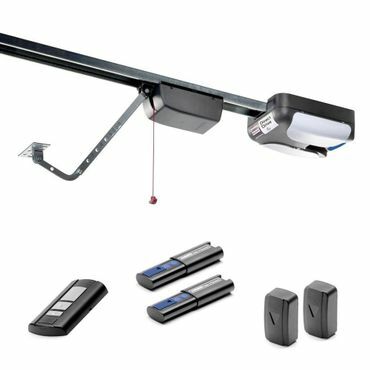 While our research reveals that no garage door opener is perfect, several models jump to the fore as offering good performance and good value in the eyes of owners. These are the openers that we've named Best Reviewed for this edition of our report.